If the July Fourth holiday weekend didn’t provide you with enough razzle-dazzle, there is always Bastille Day to look forward to. Held on July 14, it venerates the French people’s storming of the legendary, impenetrable prison back in 1789. This mass revolt and insurrection was the kickstart of the Revolution that claimed the lives of laborers and lords, average joes and the aristocratic gentry. Today the event is marked by firework displays, marching bands, and musical performances. It is the Gallic version of America’s Independence Day festivities. 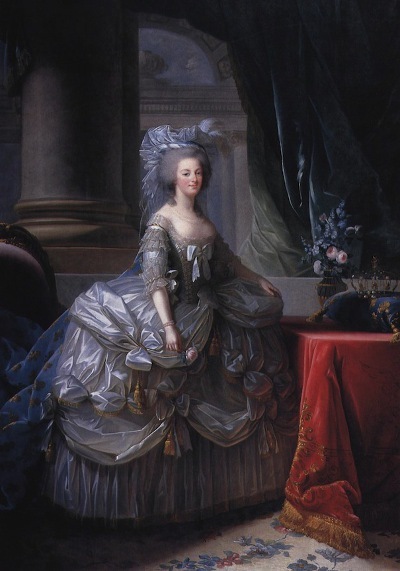 Interestingly, Bastille Day marked the beginning of the end of Queen Marie Antoinette’s tenuous hold on her population. Always a controversial figure, the queen and her husband’s failure to quell/calm/understand/respond intelligently to the uprising led to their executions four years later. The days of the French Revolution are dramatic, intense, passionate ones. The decade that came before was steeped in high finance, high fashion, and high society. It was a heady time to be alive — pardon the pun — and Marie Antoinette embodied it. The queen had her vocal detractors and her toady supporters, her vociferous haters and her unapologetic lovers. In her court, she LITERALLY had fan girls — young admirers who served her and traded gossip with her behind their all-purpose paper or silk fans. But did you know that the queen was abetted in her social follies, and in her rise to international fame, by her handpicked clothes designer? And that very same wardrobe mistress also helped to launch a fashion-doll fad? C’est vrai! It is all true. To understand Marie Antoinette, it helps to envision her in the contemporary world — to think of her in terms of a modern counterpart. Imagine, if you can, an amalgam of Princess Di, Kate Middleton, all the Kardashians — and throw in the Jenners — sprinkled with a pinch of the Obamas and the Clintons and the Trumps. (We are talking about a head of state, after all.) If you can process all of this, you have an inkling of how well-known and studied the queen was in her heyday. Ironically, the woman who came to define French sophistication, wealth, and self-indulgence was actually Austrian. 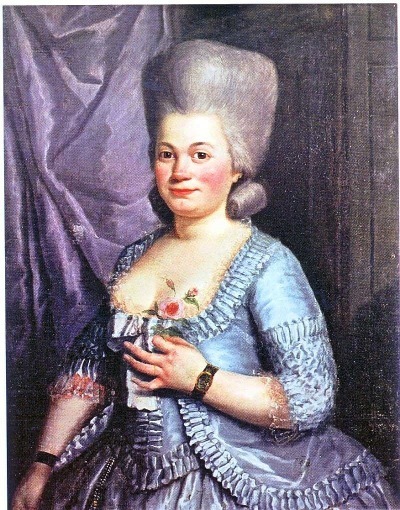 Born in the Hofburg Palace in Vienna in 1755, she married her husband, who eventually ascended to become Louis XVI of France, in 1770 when she was 14 years old. She was a teenager who was used by her parents — her father was Francis 1, the Holy Roman Emperor — as a bargaining chip to build alliances and strengthen a commitment against Prussia and Great Britain. So as a young maiden she left the comfort of her home — even if it was a palace — and met her fate as the Dauphine of France. Her husband-to-be, the Dauphin Louis, had never met her and was given a portrait of his intended to help alleviate any nervousness or trepidation. 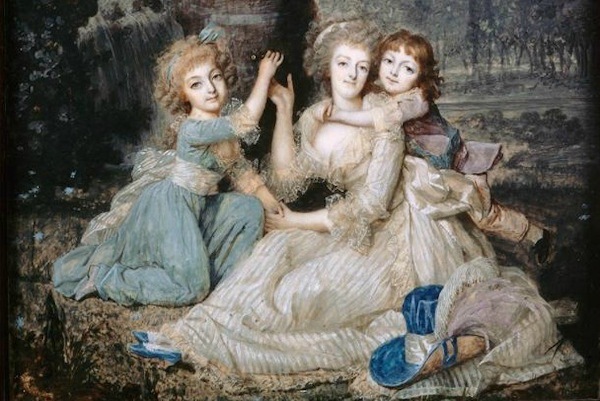 Marie Antoinette — called Antonia in her personal life — was quite the looker, and her beauty made her a popular subject for painters and sculptors throughout her brief lifetime. Married to a stranger, Antonia had to mince her way around the internal affairs and intrigue of the French court. She built a coterie of dedicated followers and adoring ladies in waiting. She bonded with her entourage with the intensity of any teenage “queen bee” (think of “Mean Girls” for goodness’ sake)! Antonia developed best-friend-forever relationships before the acronym was ever invented, and among her BFFs were her sister-in-law, her royal portraitist, and her fashion designer/hairdresser. The ties between Antonia and Rose Bertin were especially tight. Antonia was the malleable clay and Rose was the energetic sculptress. Together they worked to mold Antonia into a superstar socialite and incomparable European trendsetter. Antonia’s status as “dauphine” changed to “queen” on May 10, 1774, when Louis XV died. Having resided at Versailles for four years, Antonia wanted a place to decorate and to rule on her own. Her husband gifted her with her own domicile a few weeks after they gained the throne. It was a sprawling piece of property (ironically) called the Petit Trianon. Rumors abounded that the queen had a line of male lovers (and some females, too) and the Petit Trianon would be a place for her to host these scandalous entanglements. The doors at the Petit Trianon were open to Antonia’s best friends and to visiting dignitaries and ambassadors that she had an interest in. Her clothing designer resided there for a while, coming and going between her studios and the royal hideaway. Hardworking citizens looked askance at the goings-on of Louis XVI and Marie Antoinette, wondering when she would buckle down and produce a brood of kids. Married for four years, there was no sign of Antonia being “enceinte” (pregnant). Those in the know said that was because the marriage was a sham — Louis XVI was just not that into his wife. The sly conversation was that he was asexual, more concerned with science projects and tinkering than with fulfilling his marital obligations. The first child would not be born to Antonia until 1778. At the age of twenty-three, Antonia became a mother for the first time, and gossipmongers had a field day speculating on who the REAL father could be. Through it all — the ups and the downs, the accusations and the acclaim — Antonia and Rose were as thick as thieves. Rose garbed the queen in outfits that seemed as if they had emerged from the canvas of a dream. And in many cases they did! Antonia would sometimes confide to Rose something that she had concocted in a daydream or while sleeping, and Rose would be able to spin it out of thin air. One of the forward-thinking styles that Rose conjured for Antonia was the overabundance of material. 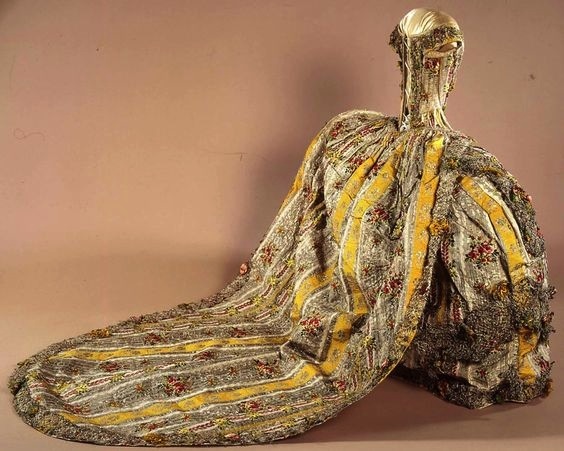 The designer would fashion outfits that were enormously wide in skirts and in bustles. 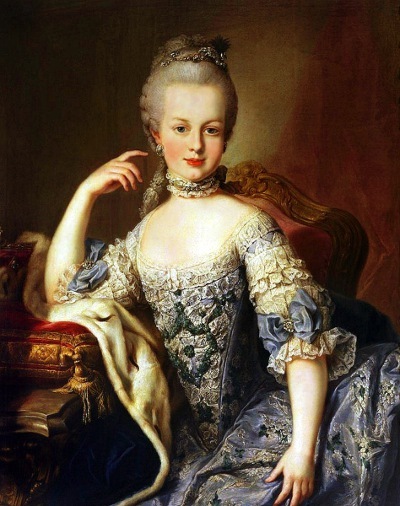 A woman’s width and dimensions would be noticeably increased — and scuttlebutts said that was because Marie Antoinette wanted her dominance and self-importance to be made clear to everyone. She wanted to take over a room when she entered it! Rose also pushed for the famous “pouf,” the hair that would be piled up atop Antonia’s head — at times adding an additional three feet of wigging to the queen’s scalp. They loved being able to share the language of clothing and wardrobe re-invention. Most definitely Marie Antoinette’s gowns and coiffures had a language all their own. She didn’t just want to make a figurative fashion statement — she wanted to make a real discernible one. 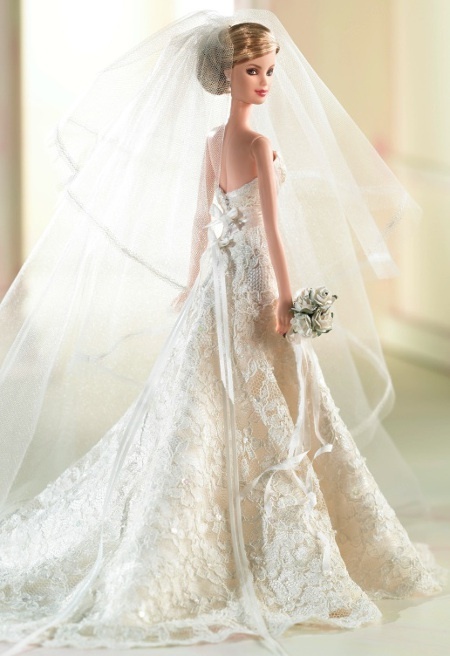 In her skyscraper-high hair, there would be jewels and tiny figures, shapes and silhouettes. Her wigs and her wardrobe blended together to tell “tall tales” or to announce the latest news or her most pressing public service. As Antonia began to have more children — she eventually bore four princes and princesses, but one died in infancy — she beseeched Rose to dress the royal toys, too. Proud to be of service to her friend, Rose created tiny mannequins and garbed them in costumes that imitated their famous mama’s outfits or outrageous ensembles all their own. 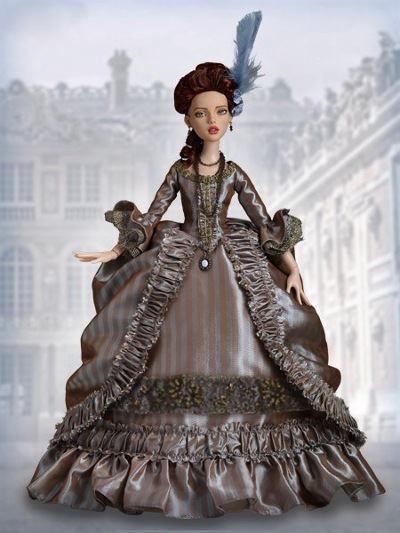 In fact, Mademoiselle Rose utilized dolls as a tool of her trade. She decked them out in samples of her latest designs and had them delivered to the nobility, the wealthy, the politicians, and the press across France and Europe. This is before the birth of fashion magazines, and these three-dimensional “pandores” or “pandoras” were ways to advertise her wares. 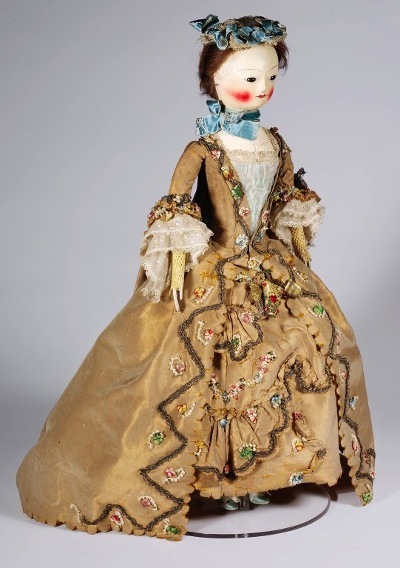 Some of the pandores were small and doll-like — these are the fashion dolls that she shared with the French crowned children. They were mainly jointed and poseable wax over wood or porcelain. Others were larger, nearly life-size. With an eerie sense of foreboding, some of the dolls were made as “half-ladies.” They were half the size of a human being, and were missing the head. They would just show off the gowns and the way it draped around the torso. Antonia’s palatial existence came to an end when she was arrested, along with her husband and children. Incarcerated, they were held as prisoners of “the people” from 1791 until 1793. Louis XVI, stripped of his title and called Louis Capet, was accused and found guilty of crimes against the French populace and was killed. His wife, Marie Antoinette, now known as the “Widow Capet,” was brought before the Revolutionary Tribunal. She was, likewise, found guilty of all the charges that were lobbed against her. The accusations ran the gamut from sorcery and witchcraft to lesbianism and adultery, thievery and espionage to consorting with the enemy and trading state secrets. She was guillotined on October 16, 1793. Rose Bertin saw the writing on the wall and left Paris during the Reign of Terror. She set up shop in London and continued to handle clientele from the upper echelons of society. While the Widow Capet was imprisoned, knowing that she would follow in her husband Louis’ doomed footsteps, Antonia wrote to Rose, asking for her to design and then send her a mourning outfit to honor the fallen king. In a very sad twist, the dreams that had launched Rose’s reputation as the “Fashion Minister” to the queen were now being utilized to come up with an ensemble that would mark Marie Antoinette’s own demise. Antonia wrote how she had dreamed of ordering ribbons from her old friend, and when Rose handed them to her, they had all turned black and then withered away. 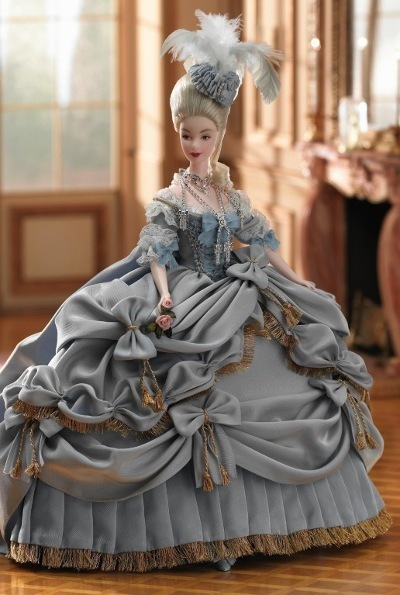 Marie Antoinette, who had been lionized and marginalized, was decapitated at the age of 37. She lived large; she loved large; she dressed large. Her reputation has been inflated over the years and she has been the topic of movies, plays, operas, and books. Among the books (I’m proud to say) are two that I co-wrote with Robert Tonner based upon his line of Déjà Vu dolls. I’d be thrilled if you checked them out on Amazon and at Barnes & Noble: Love, Death & So On is the first one, and No Time to Waste is its companion short stories. 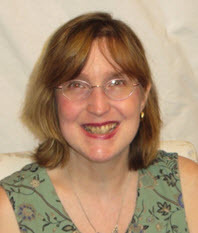 I think you’ll find the books to be entertaining, educational, and quite enjoyable. And what better way to celebrate July 14 than to lose yourself in a world that once was, and never will be again. Happy Birthday . . . no, make it birth-week! There are too many dolls for a day.